← Dinner – Il Corso – March 24, 2019 – Palm Springs, CA. Antigua Kitchen + Bar – Dinner & Lunch – March 25 & 26 – Palm Springs, CA. Located right on Palm Canyon, Antigua Kitchen will get your taste buds going. 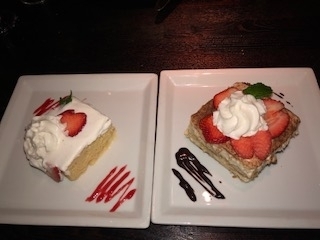 You will love all the Mediterranean and American authentic dishes, with Antigua Kitchen being super conveniently located right in downtown Palm Springs, in a very upscale area, chalk full of dining, hotels, and nightlife. Owner Sal Zavala also owns L’Olivo Italian Bistro down the street. I did a review back in 2017. His Father Sal Sr. is in the kitchen at Antigua, some of Sal’s family is from Spain, and his father is from Michoacán Mexico and has lived in The Coachella valley for most of his life. Most of Sal’s family is working with him at Antigua Kitchen. 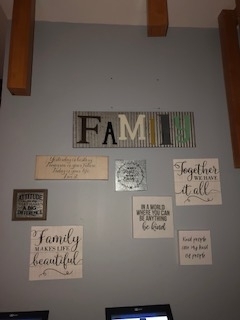 It is truly delightful having all of their family members, even Sal’s sister Sandra is there to greet all of the customers. What ever their business model is it is really working. I went for dinner one night and then got invited in for lunch the following day to really taste everything and not be too stuffed. What a great way to enjoy their marvelous cuisine. Sal wants my readers to know that when you come to Antigua Kitchen you will be taken care of like family with their unique style of cuisine, he wants everyone to feel this inviting atmosphere. There are so many great places to eat in Palm Springs and it’s hard to decide but Antigua Kitchen is a great choice for lunch or dinner. Excellent home made fresh Mediterranean food and warm and friendly service. 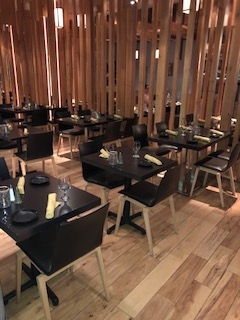 The interior has rustic wood paneling and partitions, with a Japanese feel because Gylo Japanese Restaurant was there before. There are black leather chairs and tables, and great light maple hard wood floors. It’s a mixture of modern with all nice little design details. 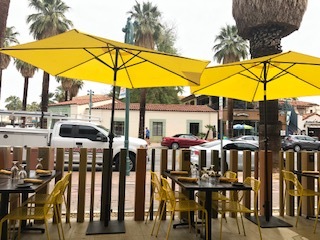 The outdoor life is huge in Palm Springs and their modern patio will give you the opportunity to people watch under their yellow umbrellas, during your amazing lunch or dinner. The music is really fun Motown, which sets a lively tone. Classic Martini, 2 olives, in my favorite martini glass this is one to remember. 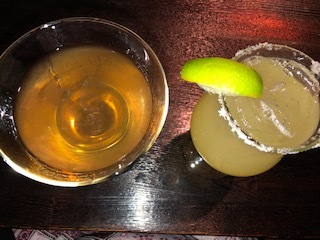 Vintage Margarita, Mi Campo Tequila, Agave Nectar, Fresh Lime Juice. A great take on a margarita; on a hot summer night this would be the perfect thirst quencher. 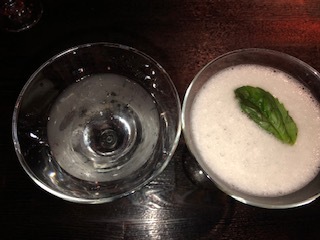 Ocean Organic Vodka, Pineapple Basil Tini Ocean, Symple Syrup, Pineapple, Basil Leaves. This is a very tropical drink, which marches the overall appeal of Antigua Kitchen & Bar. Ocean Organic Vodka, Cane Field Cosmo, Gran Marnier, Fresh Orange Juice, Splash of limejuice, squeeze of Lime. A great example of how a Cosmopolitan cocktail can be done so creatively. Krispy Calamari, lightly fried, with tartar sauce, this Calamari is cooked right, crispy and tender. 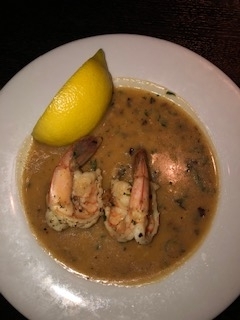 Pacific Prawns lemon, garlic, white wine sauce, for sure a dish you need to try, sumptuous garlic sizzles in your mouth. 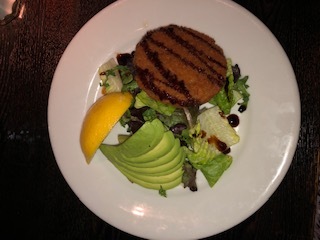 San Francisco Crab Cake, with avocado, aged balsamic glaze. Another great take on an existing classic, very good choice. 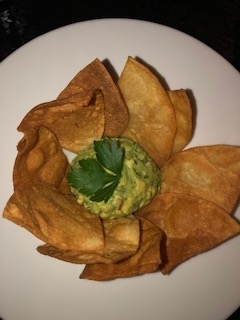 Batan Avocado with avocado dip, tortilla chips. A great way to get your appetite going. The Duo with crisp onion rings, shoestring fries. I love great onion rings and these do not disappoint. 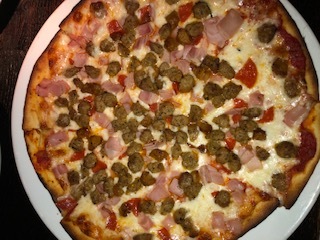 Chef Sal’s Special, with light marinara, mozzarella, pepperoni, ham, mild sausage, just a great pizza, order this one, you will be happy you did. 1930’s Bleu Wedge, with iceberg, tomato, bacon, red onions, Bleu cheese crumbles, Bleu cheese dressing. 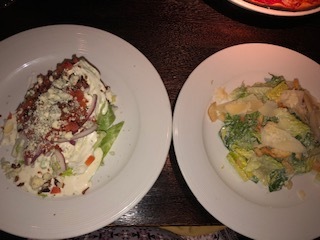 I just love a good wedge, the lettuce is super fresh and crispy, and the dressing is rich and creamy, a definite keeper. 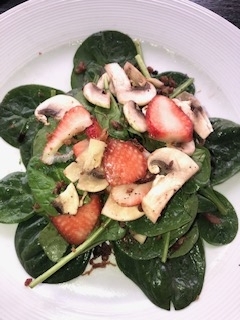 Baby Organic Spinach Salad with bacon bits, diced mushrooms, berries, home made raspberries vinaigrette. The presentation is delightful, with the strawberries and really fantastic salad. Caesar Cardini’s, with hearts of romaine, shaved Parmesan, crostini, Caesar dressing. A nice rendition of a Caesar, the dressing is equally terrific. BLT, with bacon, lettuce, tomato. 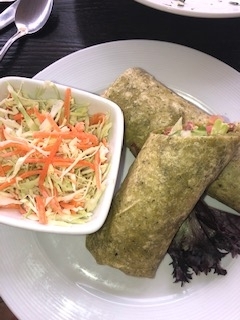 A very big wrap with great bacon flavor, a terrific lunch item. 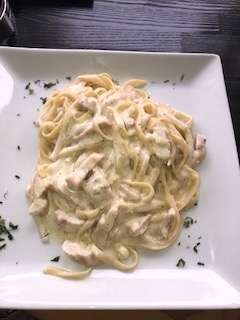 Fettuccine Alfredo, signature Alfred sauces. This pasta is so creamy with superb cheese sauce, just the best. 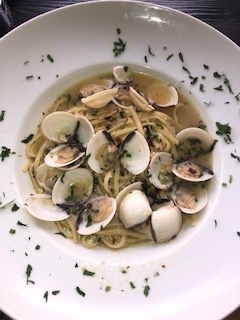 Linguine Clams with garlic, olive oil, Pinot Grigio natural sauce. The clams pop in your mouth and the simple sauce adds to the overall experience. Lobster Ravioli with vodka cream sauce, and basil. 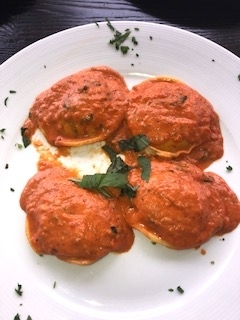 These are huge raviolis, with bites of lobster, a very filling menu item. 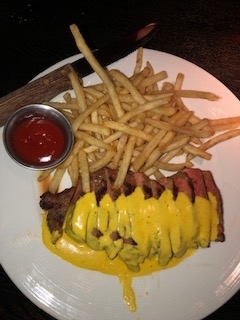 L’Entrcôte de Paris, 1940 butter-based sauce served with grilled beef with fries. This is very French but totally worked for me, especially the sauce. 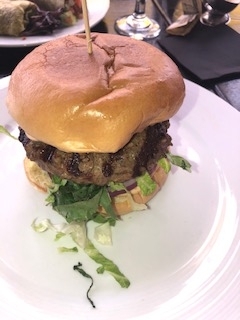 Antigua Burger, 8oz. Angus beef, lettuce onion, tomato with house spread. Oh what a burger, I would come here just for this. 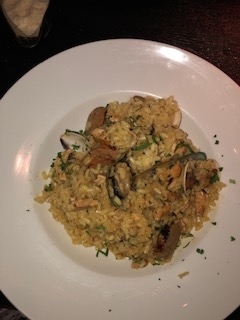 California Paella, with mild sausage, clams, mussels, white wine. A nice subtle paella with great Spanish seasonings, a true winner. Antigua Tiramisu, luscious, smooth, just what the doctor ordered. Tres Leches Cake, this is a super rich cake so save room. 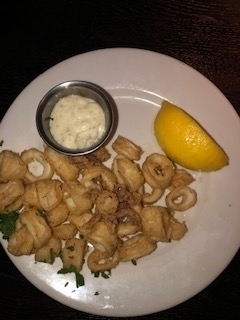 Ruffini, pinot grigio “Lumina” Italy, a great pair with the Krispy Calamari. Simi, Chardonnay, Sonoma County, you just have to try this wine with the Pacific Prawns, its very buttery so it adds so much nuance to the garlic sauce. Vanderpump, Rose, Provence, France, yes this is Lisa Vanderpump wine and without all of the hype it is a great wine. Genesis By Hogue, Syrah, Columbia Valley, do this wine with L’Entrcôte de Paris, it’s the perfect steak for this very meaty Syrah. Ravenswood, Zinfandel, “Old Vines”, Sonoma. Really a great old vines Zinfandel is truly my favorite wine. I loved this wine with the Sal’s pizza; it’s an interesting choice but somehow it works. This part of downtown is really being built up; there is a whole new resurgence. It used to be that all of the businesses would close down for the hot summer months, but with the advent of the misters they can open all year long. Tourists from Germany especially love the hot summer months. From my home in West Hollywood I watch the weather during the summer and always see it always be about 20 degrees hotter there from June – October. My season to go visit is November – May, just the perfect temperature for me. Antigua offers quality dishes, with locally sourced ingredients and a casual desert dining vibe. Antigua delivers when it comes to high-end quality cooking from many cultures and attracts a very chic city crowd. Its dining room, which features a spacious 30-foot bar and dining room seating up to 120 people, while more can be accommodated out on their patio. For a romantic dinner, request a table next to their outdoor fireplace with low lighting. Palm Springs really is the place to be, so any choices so little time. But with Antigua Kitchen and bar, you get many options that are all great. A fun new people watching spot, with great food and luscious cocktails, what more could you want. 105 S. Palm Canyon Dr.